Silence can be a Lenten discipline, a way to calm our troubled minds. Just as the body can be trained, so can the mind. Contemplative Prayer is sitting with God in silence. There is no need for words. We can sit, with a straight back, focus on our breathing and on God. You can contemplate the peace of God or the name of Jesus or another name or character of God. This can be a source of refreshment and peace in your day. Work up to twenty to thirty minutes of just resting in God’s presence. Choose a name for God or a word or phrase to contemplate, such as Peace, Lord of All, Jesus, Love, or one of your own choosing. 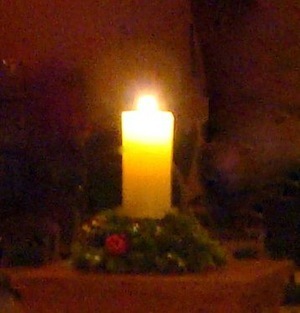 Many people like to light a candle. As thoughts pass by notice them as if they are on a screen before you. Let them go. Do not fight to keep them out. Do not dwell on them. Just let them pass by and return to the word you’ve chosen, such as Peace. Train your mind so that with God’s help, you are in control, not the worries of the day. Look on Amazon, in the library, or book store for more information under contemplative prayer by Thomas Merton, Thomas Keating, or Basil Cunningham. Reading is NOT the same as praying. It is the practice of prayer that is beneficial, not the reading. You might consider starting a group that reads a scripture, lights a candle, sits in silent prayer for twenty minutes, and closes with a spoken prayer. Silence can be a release from the anxieties of the day, time to be with God. Sonja, thank you for this. Settling into silence is so important in these times of hurrying and worrying and doing. I like to walk the labyrinth in our church prayer garden, sitting in silence when I reach the center before I begin the outward walk.